The Bormio electric fireplace from Klarstein conjures realistic flame illusions in every room. The gentle light deceptively imitates real flames and smoldering logs and instantly spreads a cozy, romantic atmosphere. On request, the heater can be switched on, dissipating heat immediately and operating at either 950 or 1900 watts. The built-in thermostat measures the current room temperature, and with the Open Window Detection feature it detects even a rapid drop in temperature and switches off the fireplace automatically. An adjustable weekly timer allows you to program the heating times for each day of the week. 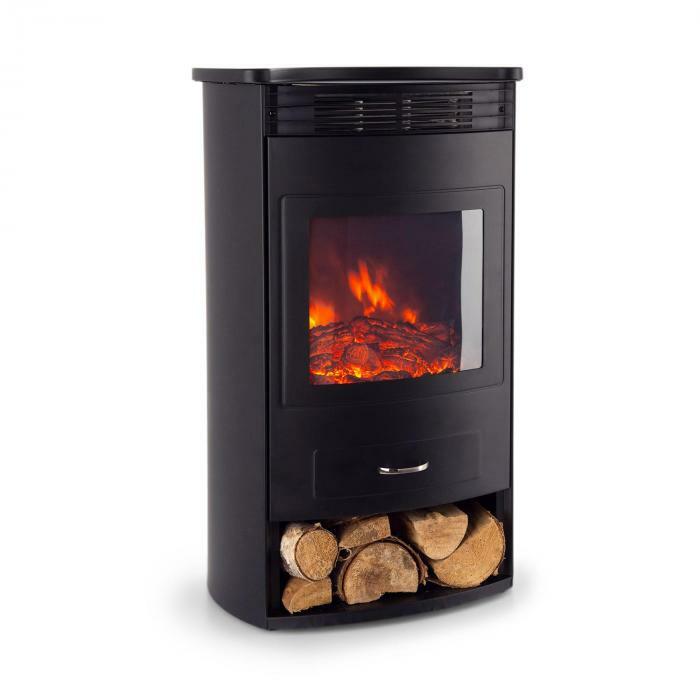 The operation is simple: in addition to the switches on the unit itself, the fireplace can be conveniently controlled with the included remote control. The classic design of the Klarstein fireplace captivates with its simplicity and unadorned elegance. The matte black and the hidden control switches add to the overall impression. A special highlight is the decorative storage space for logs in the foot of the fireplace. No matter whether the furniture is rustic or modern, the Bormio fireplace from Klarstein conjures up a romantic atmosphere everywhere and gives the impression of being in front of a roaring log fire without fire and soot. Note: This product is only suitable for well-insulated rooms or for occasional use.